Lithium batteries provide the best capacity to weight ratio and function fully down to -20-degrees F.
A compact light with such impressive specifications and capabilities will be useful in a wide variety of lighting situations: hunting, camping, fishing and other outdoor activities; projects around the home, shop and, of course, emergencies. The red (night vision) mode makes this light potentially useful for amateur astronomy, but the fact that the T1 switch sequence is designed to go from off to red to green to UV to red SOS to off again is undesirable for preserving night vision. Here is how to circumvent the sequence: simply leave the red light on for at least five seconds. After the red LED mode runs for five seconds, the next click of the tail switch turns it directly off. A subsequent push of the switch turns the red LED back on. Always let the red LED remain on for at least five seconds and you will never be bothered by the green or UV LED's. Battery replacement is, thankfully, straight forward. Just unscrew the tailpiece to change batteries, like an ordinary flashlight. The front bezel is integral with the body, as it is never necessary to replace the LED bulbs; they have a run time of over 10,000 hours of continuous use. There is only one switch, an easy to operate push button at the back of the tailpiece. I like rear mounted on/off buttons, as I think they are less likely than barrel-mounted sliding switches to be inadvertently switched on when the flashlight is carried in a pack. The T1's on/off button is slightly recessed to make inadvertent turn-on even more unlikely. It is a good, thoughtful design. Press on/off switch to turn white LED on in High mode. Press again for Low mode. Press again for Quick Strobe mode. After selecting any mode and waiting at least five seconds, the next press of the switch will turn the light directly off (not to the next mode in the sequence). Press and hold down the on/off switch for three seconds to switch to the color LED mode. The Red LED will come on. (It is useful to retain night vision.) Press again within five seconds to turn on the Green LED for map reading. Press again within five seconds to turn on the UV LED to highlight blood and other fluids. Press again to start the RED LED SOS mode. After selecting any mode and waiting over five seconds, the next press of the switch will turn the light off. At any time, pressing and holding the on/off switch for three seconds will revert the light to White LED mode. Two warnings are worth repeating. First, do not stare directly into the light; it is extremely bright. Second, the light will become very hot when used for extended periods. The T1 runs on two CR123A cells and a pair of Duracell batteries was included with my test light. Contrary to what some people think, CR123A batteries are no longer particularly expensive or difficult to find. They are in stock almost anywhere batteries are sold in the U.S. and can be purchased inexpensively in bulk packs. For example, a Ray-O-Vac CR123 twin pack at Batteries Plus runs about $10. A Streamlight 12 pack costs about $27 at the same store, which is only $2.25 each. The white LED, located in the center of the reflector, throws a light pattern with a bright center spot and a much dimmer, but very wide and well defined, circular surrounding area. This is a good general-purpose light pattern, spot lighting your subject with an adequate illuminated peripheral area. I compared the T1 at night to a large, top quality, three D-cell halogen flashlight and it made the latter look pathetic, both in terms of center brightness and light cone width. 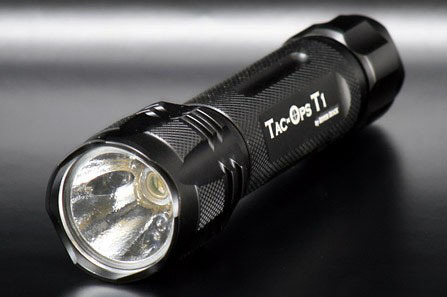 Modern LED lights like the T1 are a quantum improvement over much bigger, conventional flashlights.